Summerhays Music Center has been supporting school music programs for over 75 years. Through that experience we have designed a rent-to-own instrument program that allows parents to feel confident they are getting the best instrument for the best price for their students. We work with many teachers in several states. Affordable monthly payments – as low as $19 per month! Will the instrument I get be appropriate for school band or orchestra? 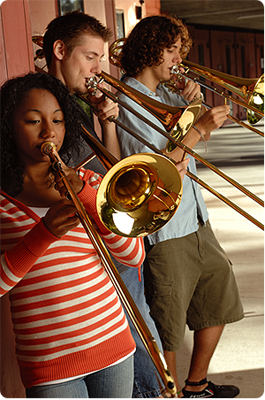 All Summerhays Music Center instruments are school-approved. Every instrument is checked, adjusted, and approved by a professional instrument technician. We work directly with school music teachers to make sure we are supplying instruments to their standards. Couldn't I buy a cheaper instrument from a private party or a discount website? Possibly, but music teachers do not recommend it. Many discount instruments are made of very low grade materials, poor craftsmanship, and very poor durability. We have seen parents bring these low-quality instruments in our repair shop when they break, only to be disappointed to hear the instrument is such poor quality it cannot be repaired. Students who play on these cheap instruments are much more likely to become frustrated while playing and drop out of band or orchestra. Also, if you're thinking of using an instrument that belongs to a friend or family member, be aware that many instruments, especially woodwind instruments, deteriorate over time, and repairs can be costly to bring the instrument back to playing condition. What if my child doesn’t stay in band? No problem. You can turn the instrument in any time if it’s a used instrument. If your son or daughter decides not to stay in band, simply return the instrument to the Summerhays Music Center or one of our dealers. A minimum rental period applies to new instruments. What if the instrument breaks or is stolen? No problem. We offer a service called “Maintenance and Theft Protection” that covers the repair of most accidental damage to the instrument and will replace the instrument if it is stolen. There is a small monthly fee for this service, but it’s worth every cent! The Summerhays Music Center has the best repair facility in the state. Non-music stores, music instrument catalogs, and internet sites do not have any way to service your instrument. You will have the option to add this service to your rental after a few more clicks. Call the store to make arrangements. * Applies to new and used student model trumpets, trombones, clarinets, flutes and alto saxophones.